Create an Excel Spreadsheet from a PDF (A-PDF To Excel)is a little difficult at usual. But with A-PDF To Excel, it becomes an easy job to batch extract and convert PDF files to Excel Spreadsheet. It can help you stay away from the boring and repetitive operation of copying the data. No need to copy PDF data. Support various PDF data, such as Invoice, Bank Statement, and Price List. Support the batch conversion of PDF. Convert multiple PDFs at one time. Customize your export and import rule. Add a table and draw vertical lines. Apply and Extract to excel. During this process, you can define the output filed columns and have a preview of your excel spreadsheet. Also, you can choose the output to CSV or XLS files. It is up to you. 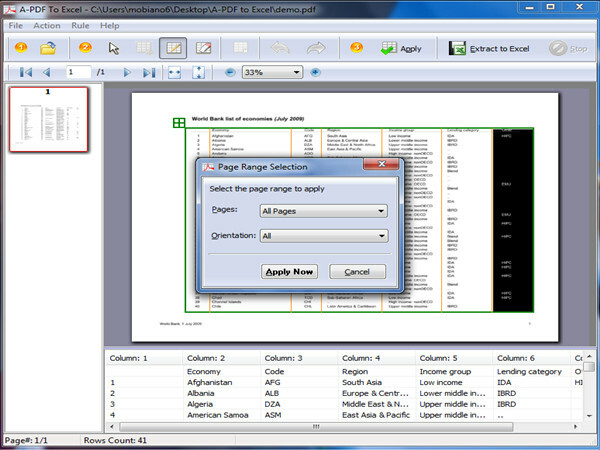 Create an Excel Spreadsheet from a PDF is not a problem with A-PDF to Excel. It is an ultimate tool designed to fast convert PDF to Excel.